As you probably are already aware, we moved into our home around 2 months ago now. In that time, we’ve hosted 7 visitors and 5 of those were overnight stays. After not having a dedicated guest bedroom for years, you can say it’s been a steep learning curve to make sure our guests are happy and comfortable during their stay! 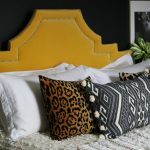 I’ve already shared how I pulled together our guest bedroom within a week of moving in, simply by using some of the things we already had but in the weeks since then, I have been able to make a few little changes that have really made such a difference in how I’m able to cater to guests. 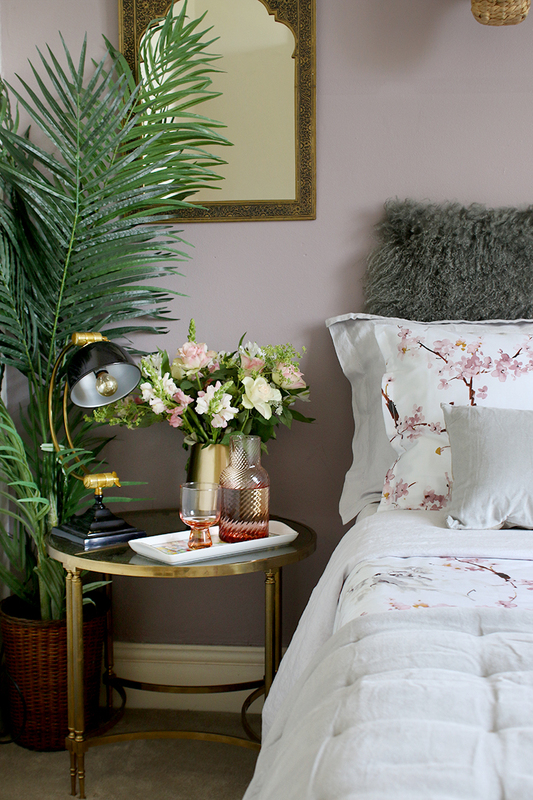 So here is my take on what you’ll need to create the perfect guest bedroom. Bear in mind, I think a lot of these things will still apply if you don’t have a dedicated guest bedroom or if you simply have a pull-out sofa or a blow up bed (as we did for so long!) but there are lots of things you can do to make your guests comfortable and feel welcome. One of the biggest changes we’ve made in this room is upgrading from a blow-up bed to a wonderfully comfortable King-sized bed. We purchased a new simple oak bed base and having received a new mattress for our own bed, decided to move our old (but still in excellent condition!) mattress into here. Immediately, it gave the room a bit of gravitas, transforming it from a makeshift room to a proper bedroom. The way I figure it, when your guests are well-rested, they’ll be a lot happier. If you have the room for it (and honestly, this room isn’t very big and there’s still enough room to move around) go for a larger bed like a King-sized bed (it’s similar in size to a US Queen for my American readers) rather than just a double bed. There’s something rather luxurious about being able to spread out a bit when you sleep so give your guests the pleasure if you are able. On the bed is 4 different pillows – 2 with plush fibre filling and 2 with a down/feather infill. This gives my guests a choice in terms of what they prefer when they sleep. Having both kinds in the room means my guests will have the best possible night’s rest on their own terms! 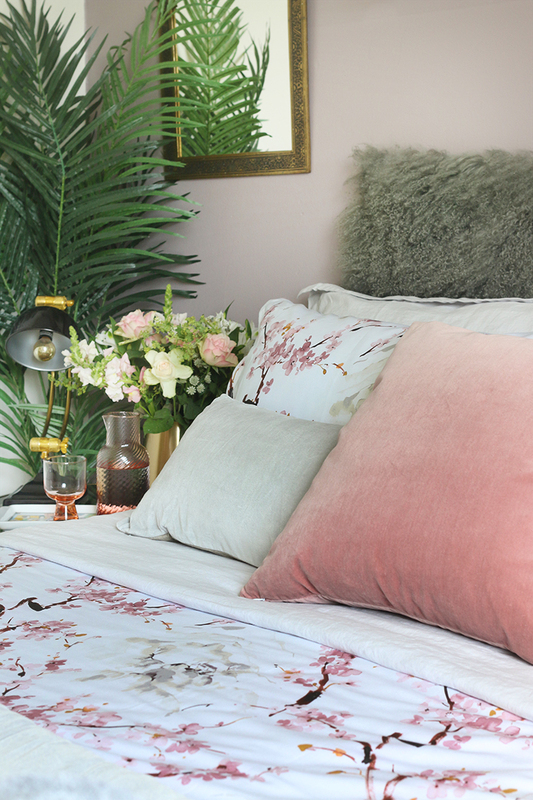 So, if you really want to give your guests the 5-star treatment, opt for good quality sheets like the stunning Vintage Washed Belgian Linen you see here. Linen is a wonderful material, keeping you warm in winter and cool in summer and it’s lightweight and naturally crumpled appearance gives it a relaxed, liveable vibe which doesn’t need to be ironed. 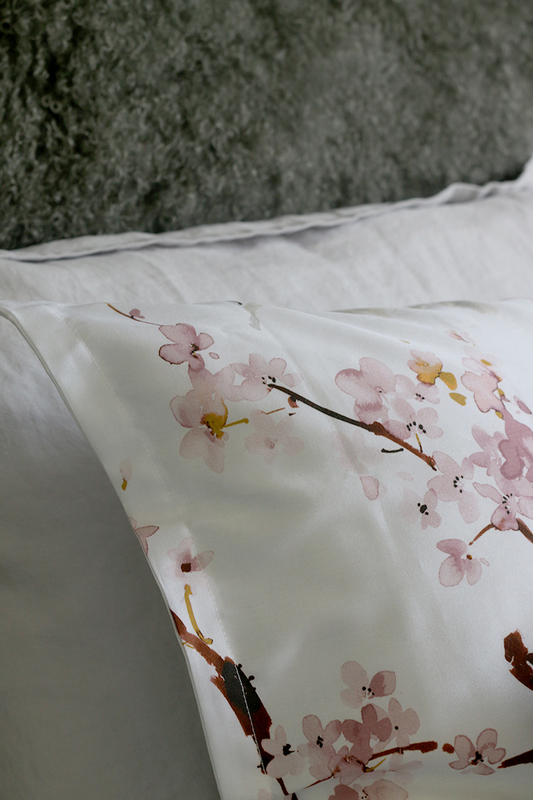 The housewife pillow covers and the top sheet have only a hint of detail which makes it easy to pair with just about any style and the fitted sheet creates a really effortless luxurious finish. 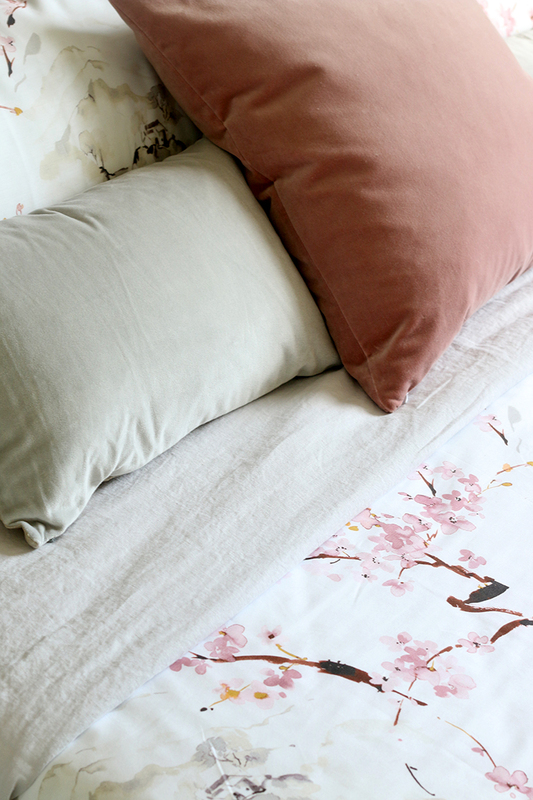 I also chose the stunning Japanese-inspired Haruki duvet set in pink. The soft watercolour pattern is simply beautiful with a soft sheen finish that feels wonderful against your skin. 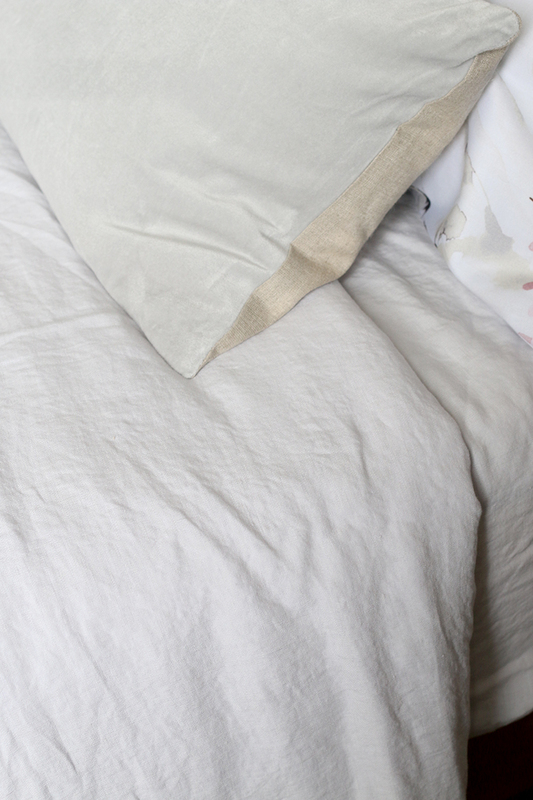 It wasn’t until I was in my 30’s that I discovered the joys of good quality bedding but honestly, once you decide to skip past the cheaper fabrics that just feel scratchy against your skin, you’ll never go back again. 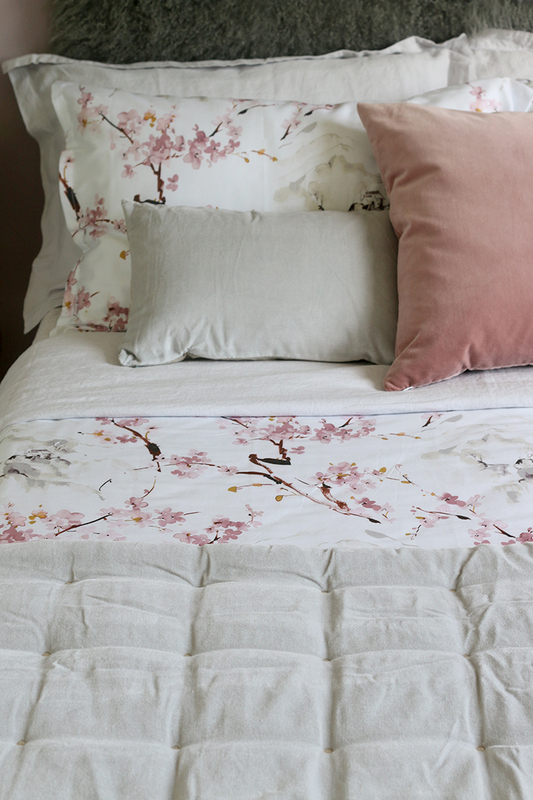 Of course, high-quality bedding is an investment but I promise, it’s a good one to make. Plus, good quality natural fibres soften with washing, feeling better as time goes on and you won’t have to replace it year after year like you will with cheaper fabrics. 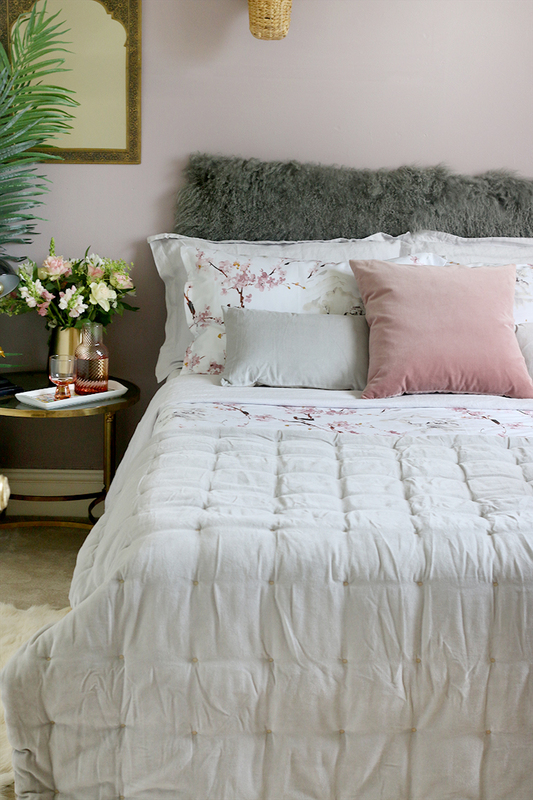 To dress the bed, I also included two velvet throw cushions in dove grey as well as a blush pink velvet cushion I already owned. 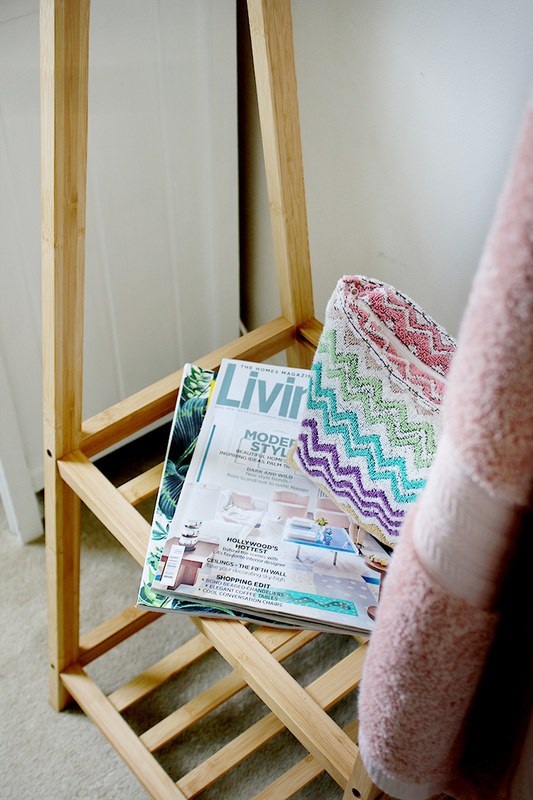 And then, to finish it all off, the Jaipur velvet throw was a natural choice. This tufted and deeply luxurious beauty has a linen back as well and gives the whole bed a hotel vibe. It will also provide an additional layer of comfort and warmth if the room gets too cold for guests. 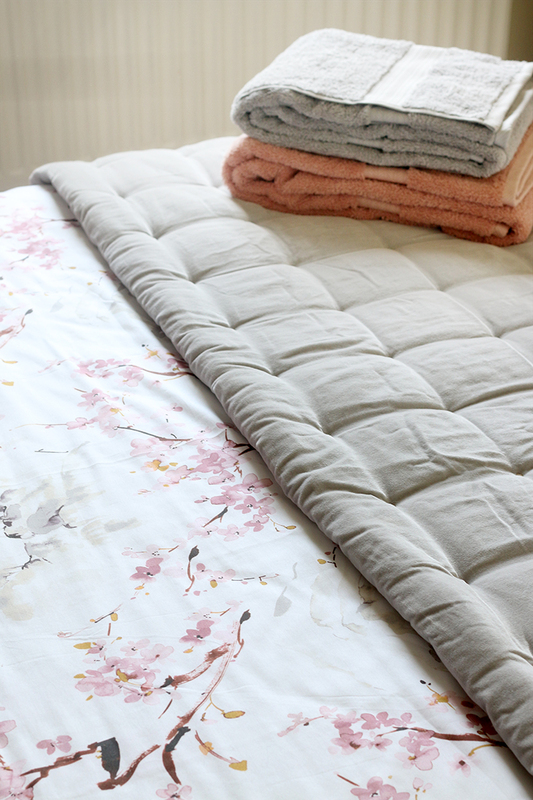 I think layering your bed is such a good idea – choosing a top sheet, duvet plus an additional blanket or throw will mean they can make themselves warmer or cooler for their most comfortable stay. Of course, there’s nothing quite as lovely as those beautifully fluffy soft towels you can wrap yourself up in at luxury hotels. Give your guests a feeling of being in a 5-star hotel by choosing good-quality towels which will wash easily and retain their softness. 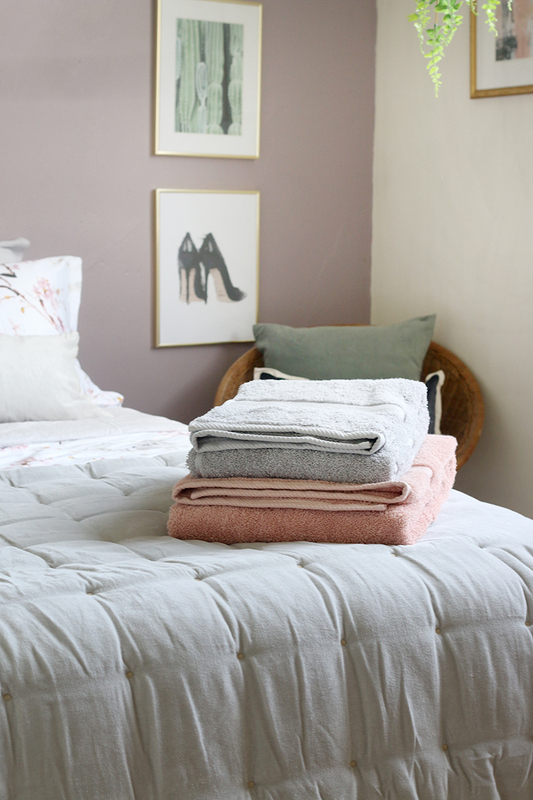 I chose two colours from Christy’s Renaissance range of towels – 2 large bath sheets in Peony and 2 bath towels in Dove Grey made with high-quality Egyptian cotton which marry beautifully to the bedding and give the whole room an added layer of boutique chic! As a side note, I’ve learned something fairly recently after having 2 sets of guests ask me for towels when there was a stack sat on the little shelf of the hanging rail (which you’ll see below). For whatever reason, people just weren’t ‘seeing’ them so I decided in the future, I’ll always put the towels right on the bed so they can’t be missed. It’s funny the things you realise are or aren’t working simply from experience! I’m definitely still learning! Considering the room has no wardrobe or closet, I knew I needed something that guests could hang clothing on so I purchased a little hanging clothes rack from Argos for a mere £40 and few pretty gold hangers for a fiver from B&M Bargains. The super simple rack comes with two small shelves and four hooks for guests to place shoes or other essentials during their stay. I left it in its natural bamboo colour for the time being but in the future, I may consider painting it! You’ll also see that we moved our old white TV into the guest bedroom atop of the chest of drawers that used to be in our living room. This chest won’t be a permanent fixture in here (I’m planning on getting a new chest of drawers for my dressing room so my old chest will move in here and this will move back to the hallway!) but it was a means of allowing guests to watch some television if they wanted to whilst staying with us. I also let guests know that the top drawer is empty so if they wish to unpack during their stay, they have the means to do that. Making sure the room isn’t stuffed to the rafters with YOUR things is really important. After all, you want your home to feel as comfortable as possible – so leave a couple of drawers empty or leave space in a wardrobe for them to put their things. And then make sure to let them know the space is available to them! After all, they may not feel comfortable opening drawers or cupboard doors so make sure they know you’ve left room for their belongings. Another thing I quickly learned is how many people appreciate having fresh water by the bedside table. I had a few guests ask for a glass of water before heading to sleep for the night and so anticipating your guests needs is always a hospitable move. 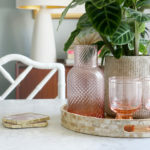 This pretty carafe and glass are from Anthropologie but I’m hoping to replace it soon with a bedside carafe in which the glass tumbler acts as a top so that the water stays clean. One one of the shelves on the clothing rack, I placed a little washbag with essentials that guests might have forgotten – there’s everything in there from spare new toothbrushes (still in their packaging) to shaving gel and shampoo and more, many of which were collected from hotel stays of my own so are in small easy-to-store bottles. I also like to include a couple of magazines that my guests can page through on their downtime. If you’ve got guests who are there for an extended stay, consider including things like a map of the local area along with recommendations of things to do or see during their stay. 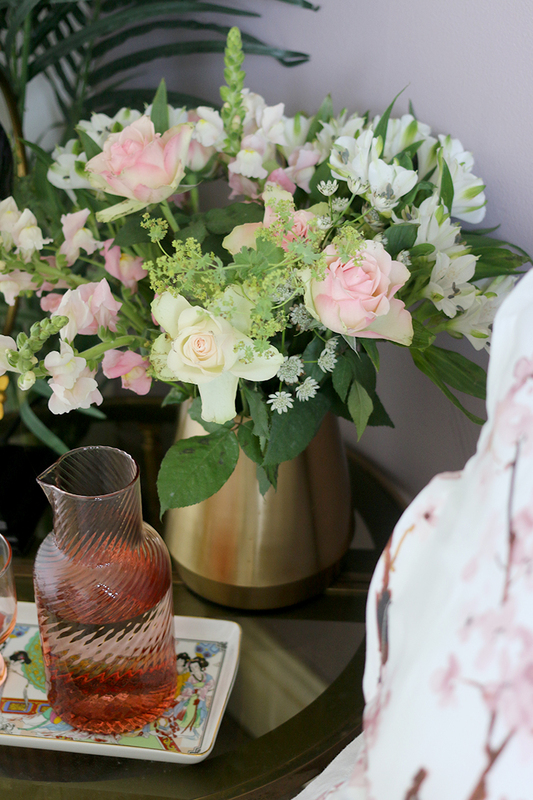 While it may not be an essential, there’s really nothing that makes a room look more well-cared-for than a few fresh flowers on the bedside table. This stunning bouquet is from Bloom & Wild but even some simple flowers picked up at your local shop or even picked from your own garden is a lovely touch and adds some life, colour and fragrance to your space. Make sure your guests have your Wi-Fi Password so they can easily get online and aren’t eating up their data while spending time with you. 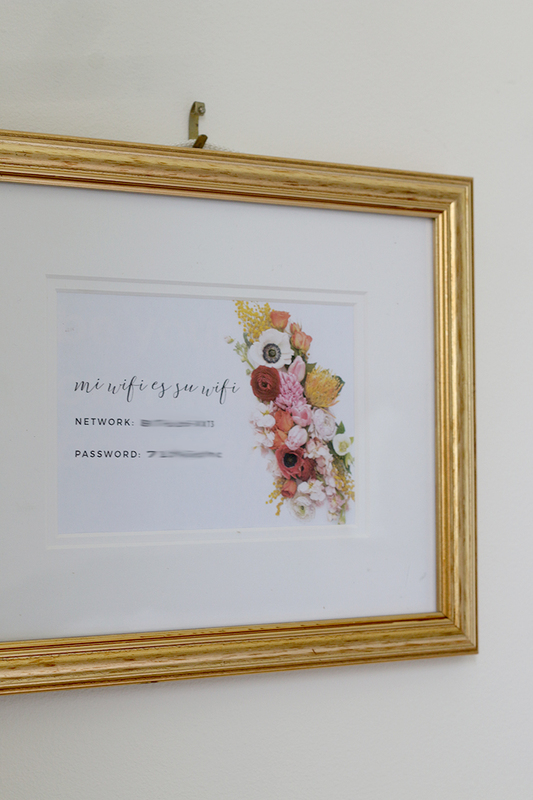 I created my own and framed it on the wall but you can get inexpensive downloadable templates from Etsy. One thing I haven’t yet been able to do is change the curtains in the room. The ones I have currently are quite light and sheer. I want to soon replace them with heavier curtains which block out the light so guests are able to sleep in a little longer if they want to! In the future, I’d also love to add a little tea/coffee area so they can make a cuppa first thing if they’d like to and perhaps a folding luggage holder for guests to easily access their suitcase. One last thing – be sure there are some available plug sockets in the room. Your guests will likely want to recharge phones, tablets or laptops or perhaps require somewhere to plug their straightening irons or hairdryers during their stay so make sure there are a few that are visible and free for them to use! One last thing! This room is still a work in progress and desperately needs re-decorating in terms of paint and new carpets but we’re hoping to tackle that over the next few months so expect some more updates on this space! In the meantime, how do you prepare for guests? Is there anything you’d like to add that make your guests feel welcome? Let me know in the comments! 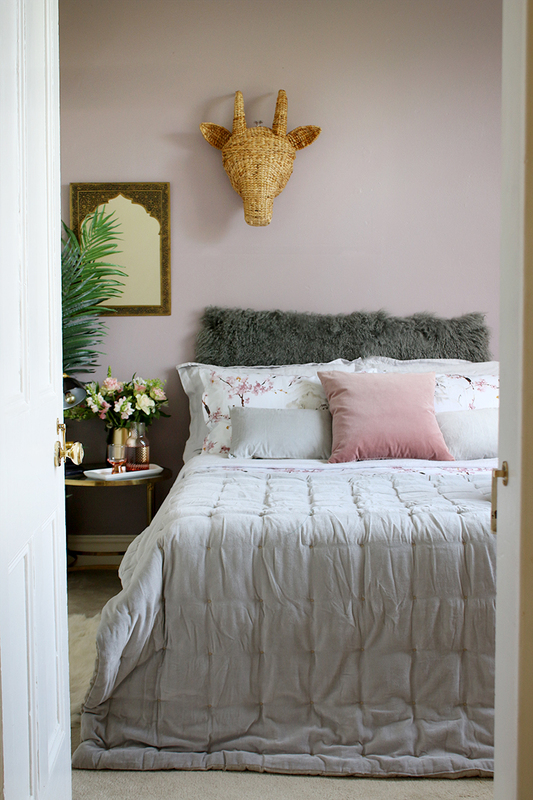 Bedroom Reveal: How to Transition a Room from Summer to Winter! Love this post. Always like the combination or splurges and basics like the Argos hanging rack. Although this weekend we have guests staying and our joiners gone AWOL and we can’t get anyone to fit our bathroom door in time! How embarrassing, I’m going to have to create something with a curtain I think to protect all our privacy. One question, how do you get your pillows all nice and plumped up? I have a lovely expensive bedding set from M&S with some lovely oxford pillowcases but they always look so drab because the pillows never fill them up. Ps. love all the insta stories at the moment. When my son moved out last year, we were finally able to have a dedicated guest room. It was redecorated and had a new carpet fitted, and we put an Ikea Hemnes daybed in there. 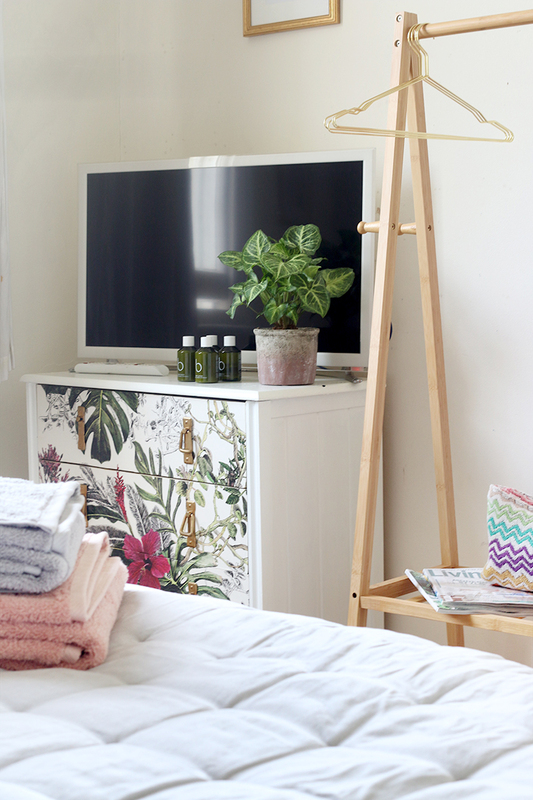 A matching Hemnes bedside table, a small fabric covered chest of drawers from Dunelm (bedding and towels from there too), and a small armchair which we’d moved out of the living room, are the other pieces of furniture we have in there. It does need somewhere to hang clothes, and some more accessories/décor, but we’re really pleased with it, and our first guest enjoyed his stay. We’ve just picked up a bedside carafe like you’re planning on getting. We were on holiday when we saw it, and immediately knew it would be perfect for the room. I hadn’t thought of tea and coffee making facilities, but that’s a good idea. A Tassimo machine would be perfect for that, as you can buy coffee, tea, hot chocolate, and milk pods for it, and it doesn’t take up too much room. Clothes storage is always a must to provide for guests and towels but I just wanted to share what our friends do whenever we go and stay with them. They have a cottage in Devon and we only stay once a year but they always leave a little sweet treat on the bed – sometimes fudge or similar and they always leave a little molton brown shower gel for each of us. It’s a small thing but it’s always such a lovely treat. My friend also leaves me a bag of sample toiletries – miniature moisturisers, a little perfume sample, that kind of thing. It really makes my stay special and I appreciate that she has thought of me to do that. I think it is just beautiful and you certainly are the thoughtful hostess. I will be awaiting my invitation! One thing to add: some info on transportation and the area for the newbies. Some great tips, thank you. My favourite is the way the wi-fi is publicised in such a charming and creative way! Full of good ideas! The bedding is to die for. I have friends I stay with in Wokingham and they prepare their guest room similarly to yours. It makes me never want to leave, but I guess I’m an ok guest, because they always invite me back! Thank you for your regular posts, which I am always so pleased to receive. you written a beautiful article. I have read this full article. After read this article ,I felt very good.